I just read that the Twelver Shia believe that the 12th Imam ‘became occulted’ in 939 or 874 or 868. That’s less than 1200 years ago. Still a long time to be flitting around, corporal or not. Strange how they have so many dates. Looks like yet another source of schism and violence. The article also mentioned some of the other sects, like the Seveners. Thank you for not provoking my uncontrollable curiousity any further than that. Taken from http://www.ezsoftech.com/stories/mis5.asp. 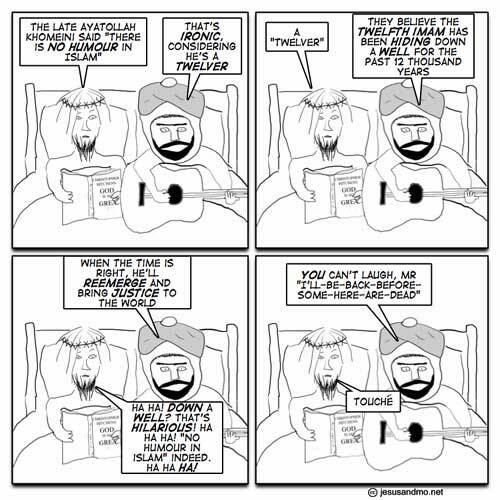 There are some islamic joke sites around, but I haven’t found any that match the level of humor here. 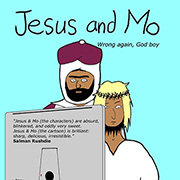 Clearly, Mo (PBUH) in bed with Jesus playing his hippy guitar is being portrayed as an insane Islamic extremist. Johnnie, the most accepted date is 874, which is when the ‘Ghaibat as-Sughra’ [the Lesser Occultation] began. The Imam was said to have been 5 years old at the time. During this time, he was concealed from the general public but often met with pious Shi’as. To communicate with the general public, he had a ‘safeer’ and there were four safeers in the Lesser Occultation. After about 70 years (equivalent to a man’s lifetime) – after the fourth safeer had died – the Imam went into Ghaibat al-Kubra, the Greater Occultation which has stretched on to date. In the Greater Occultation, he doesn’t meet with anyone except the most trusted Shi’as [I don’t think they even exist anymore!]. He is seen as a savior figure, about to set things right and avenging his forefathers of the injustice shown to them by the various [and according to Shi’as, illegitimately installed] caliphs of the Islamic state. He is supposed to pave the way for the coming of Jesus. Its gotta be pure idiocy to believe in these crap stories about Imam’s occultation, etc, and meeting with trusted (meaning self-installed) Shia leaders, etc. I wonder how the human species can close his mind and believe in the unproven and the unprovable to the point that he wants to rule and enslave others through this belief (with the help of the AK47 and the RPG, of course). Is Mo’s guitar a Cat Stevens reference? @Hamidreza: How does one rule & enslave with the Role Playing Game? Be careful with your TLAs. Danu, so, essentially he’s King Arthur? I have a fridge magnet with the legend, “Out to lunch, back in five years”. Those guys are a little less precise. Hey, Jesus’ father told him he’d be back in a couple of days. You see Jesus is traveling to Heaven at light speed so he experiences no time passing. A couple of days in Heaven for R&R and he’ll be right back. He’ll be surprise that the Earth has been wiped out by the Sun going red giant. On the island of Tanna in Vanuatu there is a cargo cult centered on John Frumm, who will bring his followers all sorts of modern goodies. When the Christian missonaries try to call this silly they respond that “You’ve been waiting for your Jesus for almost 2 thousand years and we’ve only been waiting less than a century. Besides our whole society is based on John Frumm and we can’t change it. They are obviously less insane than Christians.